High-brightness, red light laser pointer with integral adjustable-focusing lens. It produces a very bright beam of light and its 635 nm emission is a near match to the long-used helium-neon 632.8 nm emission laser. Featuring an adjustable lens, the laser beam can be focused to a fine spot for detail or "opened" to show a broader view for any type of optical experiment or presentation. 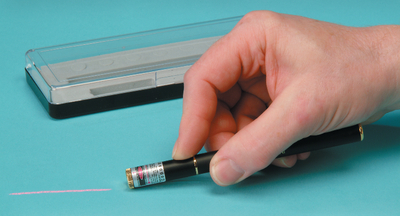 This laser is a great product for educational use, audio/visual presentations. Ordering information: Includes carrying case and two AAA batteries.